Do We Really Need Another Recording Program? Yes, when it’s this unique. 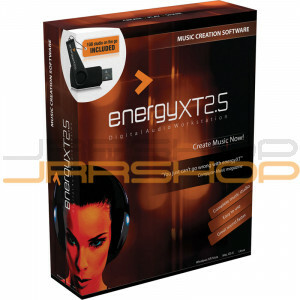 In the world of bloated, resourcehungry music production software, energyXT2.5 is like a breath of fresh air. Imagine a digital audio workstation program that opens in mere seconds from a thumb drive that can be transported from computer to computer — even between Windows (including Vista), Mac OSX, and Linux operating systems. energyXT2.5 is a compact, easy to learn and use “Studio On-the-Go.” You can take it and your project files to a friend’s house, or to a professional recording studio on the included USB drive. You can even multi-track export your recording from energyXT2.5 to all other DAWs. energyXT2.5 also features its own bevy of synthesizers, including one that functions as a dedicated drum track. With its top-quality sound and speed, energyXT2.5 lets you Create Music Now! Transferring music ideas from your soul to an MP3 shouldn’t be a Herculean task. And it shouldn’t take weeks in the studio and wads of cash to make your tunes a reality. energyXT2.5 allows you to record instruments and vocals directly to your computer via a simple USB interface. You are then free to copy and paste tracks, as well as edit, add eff ects and mix them to your heart’s content, with stunningly professional results. energyXT2.5 makes it easy to take your music from a simple concept to a high-quality, finished masterpiece you can play, share and even upload to your favorite music site. energyXT2.5 opens in seconds from the included highspeed USB stick. You don’t even have to install the soft- ware since it runs directly from the USB drive. With energyXT2.5, you can bring your projects to colleagues or friends on the stick and leave your valuable equipment at home — just export your projects to the DAW used wherever you go. Built for musicians by musicians, energyXT2.5 is easy to learn, logical to create music in and, most importantly, is designed to support your creativity. The way you make music will feel different with energyXT2.5, because you won’t be bogged down in menus — you’ll be able to focus your energy on music creation. Put simply, energyXT2.5 unleashes your creativity, letting your music flow. Even if you don’t have the latest, greatest computer, with truckloads of RAM and all the “bells and whistles,” you can still lay down killer tracks with energyXT2.5 Built-in professional features like Freeze and Bounce to Audio Track sip so lightly from your CPU, you’ll hardly know they’re even running. You can create, mix and record professional quality music with a minimal amount of equipment and computing horsepower with energyXT2.5. energyXT2.5 runs on virtually ALL upto- date computers which meet the system requirements, so it doesn’t matter if you use a tower PC, laptop, MacBook or iMac. Operation is independent of the OS, meaning it runs equally well on Windows XP, Vista, Mac OS X or Linux systems, such as Ubuntu. energyXT2.5 even runs on most netbooks! There is no huge manual to read with energyXT2.5 — you’ll be tracking and mixing in no time fl at, thanks to its easy-to-understand interface and simple drag & drop clip manipulation. One thing you’ll notice right away is that energyXT2.5 is laid out in beats and measures, just like music. energyXT2.5 gives you the tools to make music, without the hassles and steep learning curve associated with most recording and production software packages. Of course, depending on your hardware, energyXT2.5 will run on nearly any mobile device including external hard-drives, USB pen drives, SD cards, and so on. You can even copy the complete software program onto your MP3 player or the memory stick of your cell phone, so you can always have energyXT2.5 with you! You don’t even need an instrument to get started, thanks to energyXT2.5’s internal synthesizer/sampler and drum machine. These awesome tone generators build keyboard parts, pads, bass lines, and more. You can either step-write synthesizer parts or use an external MIDI instrument for real-time recording — and opt to use the onboard sounds or import your own. If you have a DAW controller at your disposal, you can use it to control virtual instrument tracks, as well as many of energyXT2.5’s mixer functions. And recording live instruments with energyXT2.5 is a breeze; just plug a guitar or microphone into a USB-equipped mixer and lay down tracks to your heart’s content. Delay, reverb, phaser and chorus eff ects are built right into energyXT2.5, so you won’t need racks and racks of outboard gear to sweeten your tracks. In addition to all of these useraddressable effects, energyXT2.5 is brimming with tonal enhancement, including a 4-band EQ on every channel, each band of which can be confi gured as LSH (low shelf), PEQ (parametric), HSH (high shelf), LPF (low pass fi lter) or HPF (high pass fi lter). And if that’s not enough, energyXT2.5 supports industry standard VST effects. Try to fi nd that kind of versatility on a hardware-style mixer! The sequencer inside energyXT2.5 works in much the same way as in most DAWs and offers everything you have come to expect: audio recording, different track types, drum loops and clip-based automation of mixer/EQ and VST plug-ins. It also has unique features like drum-machine track, per audio clip resample, elastic time-stretching and modeless editing for lightning fast workfl ow. Tracks can be arranged into folders to save screen space and VST plug-in editors can be docked into separate tabs. You can open as many sequencers or mixers inside energyXT2.5 as you like. This allows you to run complex loops, which are always in sync with the other, or “main” sequencer. You can even run the sequencers as two turntables! 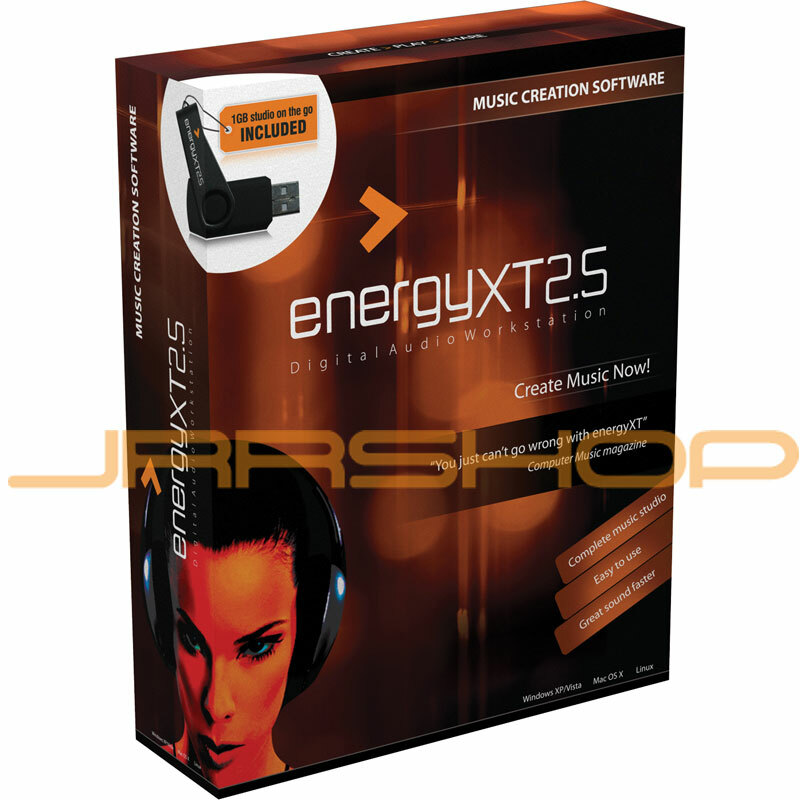 The energyXT2.5 VST version also works as a plug-in, inside energyXT2.5 itself. And it doesn’t matter if your host supports VST eff ects, VST instruments, or both — you can use energyXT as a plug-in on any VST host. The possibilities are virtually endless! Use the multi-layering capability to create your own Grand Piano layers! The drum track feature in energyXT2.5 works just like a built-in drum sampler. The drum editor looks like a real drum machine and samples can be dragged and dropped right into it for quick drum set construction. The resulting drumsets can even be saved as presets. To create a new drum track, simply drag a drum set or a WAV fi le into the sequencer, and the track is created for you automatically. Want to make a drum loop library? Just right-click any drum part in your project and save it as a single file for use in future projects. Most settings in the main mixer can be automated from the sequencer, including volume, pan, mute, EQ and effect parameters. There is no limit to how many insert and send eff ects you can use in a project, except for your CPU. Group channels are available for sub mixing. These channels can be automated just like normal mixer channels, and will support insert and send eff ects as well. The mixer is dockable, and presets for different mixer views can be customized. VST plug-ins, samples and presets can be dragged into the sequencer tracks and mixer effect slots. energyXT2.5 will auto-detect if you drop a VST instrument into the sequencer, create a new MIDI track and connect it to the instruments automatically. The same thing happens if you drop in a drum sample—the drum track is created for you, ready to play! energyXT2.5 off ers a modular design feature. The Modular view allows you to visualize all the VST plug-ins, sequencers and audio inputs/ outputs used in your project. In this view, you can easily set up energyXT2.5 as a standalone eff ects processor. Just drop a few effects into the Modular view, route the audio input through the effect plug-ins and then to the master out. And energyXT2.5 makes an outstanding eff ects processor for live guitar or keyboard setups. An outstanding feature in energyXT2.5 is the Arpeggiator, which steps through the sequence of notes you have played on your MIDI keyboard (or are playing back from a MIDI track), and plays them back in sync with the tempo of the song. Arpeggios work great for everything from basslines to chords and background melody lines, and are often played live from a MIDI keyboard. And the Random and Swing functions can be employed, giving these arpeggiated parts a more unique, “human” feel. The Arpeggiator is available on MIDI tracks in the sequencer, as well as a Classic Arp component in the Modular view. Loops are MIDI, audio or drum parts that have been saved as fi les. You can easily create and manage your own loops library and re-use the fi les in new projects. One of the best things about loops is the ability to save VST patches with it. This means that if you save a bass part with your favorite VST instrument (or the builtin synthesizer) and later drag the file into a new project, not only does it load the bass pattern, but it also loads the VST instrument and the patch automatically. The advanced thread-based audio engine in energyXT2.5 lets you stretch, change the pitch and reverse audio clips in realtime. energyXT2.5 features the high-quality elastique time-stretching algorithm from plane development. With it you can resample audio clips and choose between Normal, Re-pitch and Stretch modes. Normal – the audio clip is played back using the sample rate of the fi le. You can alter the speed of the playback by modifying the coarse and fi ne-tuning controls. Re-pitch – the playback speed of the audio clip is locked to tempo. Slowing down the tempo will play the sample slower. The length of the audio clips can still be changed, and can create some very interesting grooves. Stretch – the playback is locked to tempo, just like in Re-pitch mode, but the pitch of the sample will not change when tempo is changed. In addition, you have coarse and fi ne-tune for pitch-shifting the audio clips without changing the playback speed. When you’ve fi nished creating and mixing your masterpiece, all you need do is select File/Export Project to WAV, and choose the format you wish to use. Files can be exported as mono/stereo WAV or AIF, with sample rates ranging from 16-bit/22.050 kHz to 32-bit/192.000 kHz. When exported, a 3-minute song’s file size can range from under 8 MB for 16-bit mono/22.050 kHz to 270 MB (32-bit stereo/192 kHz). The same 3-minute song, rendered at 24-bit/ 44.1 kHz stereo (CD quality) would be about 46 MB, and only 4.6 MB when formatted for mp3. Note: MP3 fi les can also be imported (drag & drop) and exported if LAME.exe is installed to the energyXT folder. (LAME.exe is not included with energyXT2.5, however it is available as a free download). The energyXT2.5 PLUS edition includes technology to expand ReWire compatible devices (such as Reason Virtual Studio Rack) with audio recording, VST instruments and eff ects. Use energyXT2.5 PLUS as the fastest launching ReWire master solution for your favorite ReWire software, with super-flexible audio and MIDI routing of ReWire instruments, support for multi-channel audio, and up to 128 MIDI to bus/channel mapping. You get the option of synchronizing playback of both applications, or only using the fully-fl edged sequencer inside energyXT2.5 PLUS. Because of its expanded functionality, energyXT2.5 PLUS comes with an extra gigabyte of storage space on the included high-speed USB flash drive, for a total of 2 GB. That should give you more than enough room for even the largest project files. Of course, energyXT2.5 PLUS is already installed on the USB drive and ready for deployment on whatever computer you choose. As we alluded to before, you won’t get bogged down in massive, mind-numbing manuals with energyXT2.5. There is however, a Quick Start Guide, a small, well thought-out User’s Guide and the online XT User Community to help you sort things out, if you do get stuck. The XT User Community is a tremendous resource, with tons of information about virtually any situation you might run into. Go ahead, just try to stump them; those folks live for a challenge!